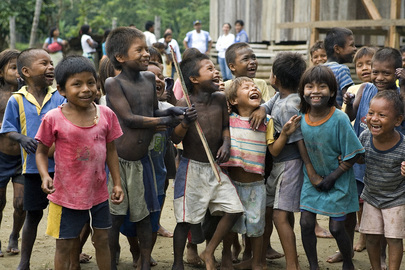 A view of indigenous children from the Embera people, displaced by armed conflict. There are over two million internally displaced persons in Colombia and while forced displacement is always a very difficult experience, it is doubly catastrophic for indigenous communities. Indigenous culture is closely linked to the land and displacement often leads to the total collapse of traditional authority and cultural patterns.